Alex Jones and his conspiracy theory empire InfoWars have officially been booted from Apple, Facebook, and YouTube. But Twitter is one of the last big social media companies that has declined to ban Alex Jones. And Twitter CEO Jack Dorsey defended his decision to allow Jones on the platform in a series of tweets last night. “We didn’t suspend Alex Jones or Infowars yesterday. We know that’s hard for many but the reason is simple: he hasn’t violated our rules. We’ll enforce if he does. 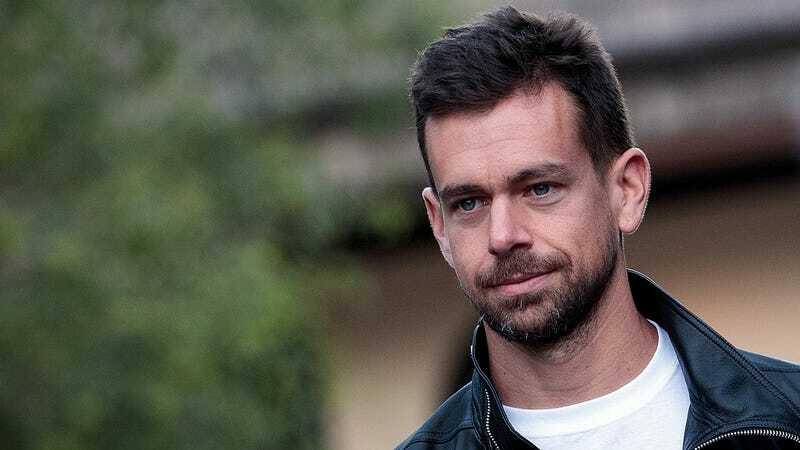 And we’ll continue to promote a healthy conversational environment by ensuring tweets aren’t artificially amplified,” Dorsey said in the first in a series of tweets. As many users pointed out, it’s not like the Twitter terms of service have been ordained by God. Jack Dorsey and the other people who run Twitter make the rules. And it’s become increasingly clear that those rules don’t necessarily “promote a health conversational environment” so much as allow fascists and conspiracy theorists to thrive. This logic, that banning Alex Jones and his ilk would “fuel new conspiracy theories” is patently ridiculous. Twitter is already a hotbed of white supremacists who believe that they’ve been shadowbanned. Outright banning of neo-Nazis and conspiracy theorists wouldn’t cause those people to feel any more or less oppressed. They already believe that they’re being oppressed and are putting red X’s on their Twitter accounts as a symbol that they’re been shadowbanned. “If we succumb and simply react to outside pressure, rather than straightforward principles we enforce (and evolve) impartially regardless of political viewpoints, we become a service that’s constructed by our personal views that can swing in any direction. That’s not us,” Dorsey continued. But it was Dorsey’s last statement that really took the cake. “Accounts like Jones’ can often sensationalize issues and spread unsubstantiated rumors, so it’s critical journalists document, validate, and refute such information directly so people can form their own opinions. This is what serves the public conversation best,” tweeted Dorsey. Alex Jones spreads provable lies through Twitter. Jones is even being sued by six families who lost kids during the Sandy Hook massacre, which killed 6 adults and 20 kids. So to claim that his demonstrably false rants are somehow serving the public conversation is absurd. But writer Caroline Moss took Dorsey at his word and tweeted at Dorsey about the Sandy Hook massacre. Moss was immediately met with tweets about the shooting being a hoax, something that Jones is famous for claiming. “Were you there? Did you see the bodies? Do you have evidence to support your claims? Or are you just taking the word of the mainstream media?” one idiot said, responding to Moss. Thanks for helping us keep the conversation going, Jack. You’ve built a great platform filled with fantastic people.